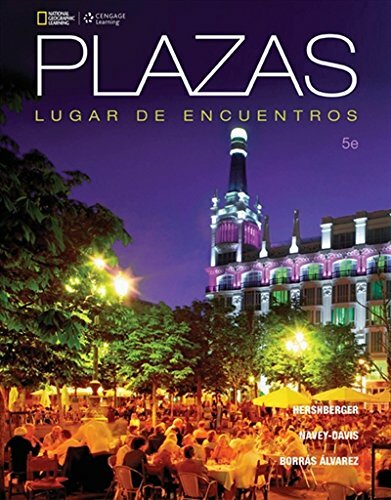 130549962X -PLAZAS: LUGAR DE ENCUENTROS, 5th Edition, is a two- or three-semester introductory Spanish program designed to support and enhance your students’ language learning experience. PLAZAS’s market leading digital and print resources work seamlessly with its rich, proven, and streamlined presentation of culture, grammar, and vocabulary. PLAZAS transports your students to a Spanish-speaking country or region for an authentic and personalized cultural language-learning experience, with culture embedded into every page to give them an appreciation of different cultural practices and perspectives. Through an exclusive partnership with the National Geographic Society, the fifth edition facilitates multi-modal interactions with cultural information in new and revised sections. Pedagogy is rooted in the research of the National Standards for Foreign Language Learning, supported by an extensive product array developed so that each standard is addressed through its most appropriate medium.